I have wanted to go to Amritsar for a while now. So, when I heard that there is a chance to stay in collaboration with Stay On Skills in Amritsar then, I grabbed this opportunity and tried to make the most of it. Home to the famous Golden Temple, Amritsar is a small city in Punjab but that doesn’t mean there isn’t a lot to see or do here. I am thankful for my stay here in which I learned so much about the culture and history of this place. Full Disclosure: I was offered a sponsored stay at City On Pedals in return for my honest review and opinion about this place. 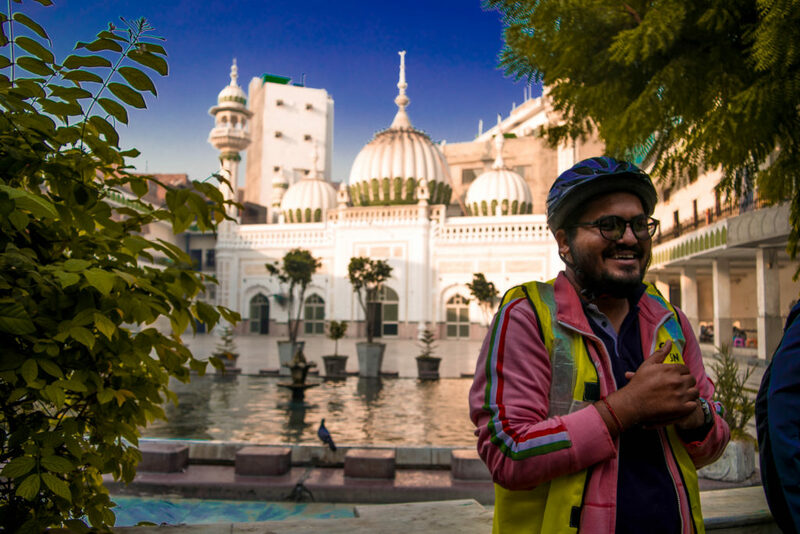 Apart from being a successful and budget-friendly hostel, City On Pedals also offers heritage and food tours which are a great way to learn more about this city. This place is perfect for families, couples, solo travelers alike. You can read on to learn more about this compact and comfortable place. Why You Should Choose City on Pedals? Currently, City On Pedals is managed by a team of 5 members and is led by Rishabh. Both Rishabh and his wife Michelle believe in welcoming people from different country and help them learn more about the local culture. They take travelers on tours all over Amritsar to give them a taste of the local culture and help their guests out in every possible way. If you are interested in volunteering at their hostel or school, then you can reach out to them for the same too. Honestly, I feel this is one of the most amazing hostels that I have ever stayed in and their tours are really informative and worth the price. In just 2 short days, I ended up learning so much about the 10 Gurus, Golden Temple, Amritsar’s architecture and history, that I wouldn’t have known if I was to explore this city alone. This hostel is located right at the city center which is why it is close to some major attractions like the Golden Temple, Jalianwallah Bagh, Partition Museum, Company Bagh, and so on. That’s not all though, located in Rani Ka Bagh, this hostel is in a safe and easily accessible area. You have all the basic shops like Medicine, Grocery, Bakeries, etc. nearby and also have access to Tours & Travels, ATM, etc. services closeby too. Most of the places are at walking distance so you can go out for a walk and find everything that you need in your immediate vicinity. Apart from the basic services and shops, you also have several street food and restaurant options to consider here when you are hungry. You get delicious Momos, Soya Chaap, Kulchas, etc. in this area which will certainly give you a true feel of the Amritsari food. And if you get late at night for dinner, then you can find a few restaurants or cafes here which are open till 10 – 10.30 p.m. to satisfy your hunger too. Apart from offering a comfortable stay at their hostel, Rishabh and his team also provide regular tours for interested guests and travelers. They have both walking and cycling tours which ensure that you get a proper taste of this city and that you are not limited to just touristy places and activities in the city. 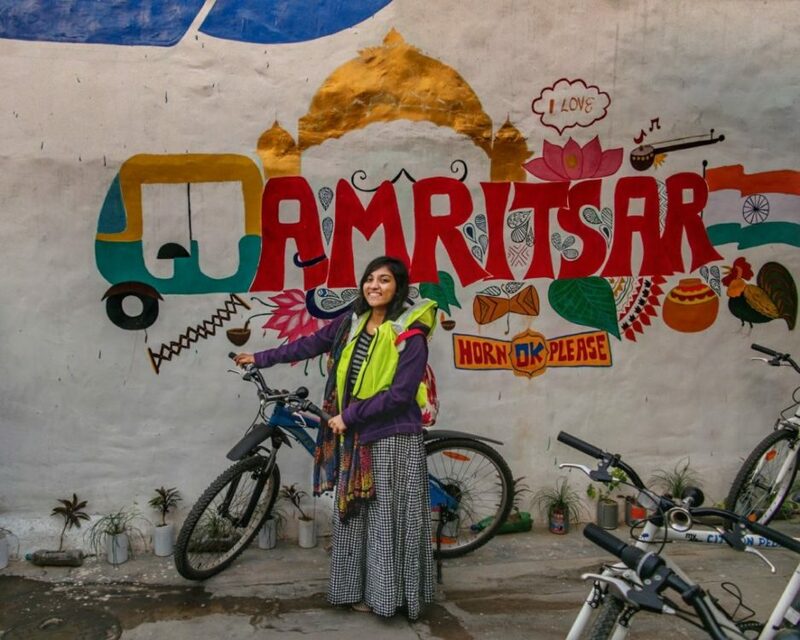 So, if you are a foodie then you can join them on one of their food tours or you can take a heritage tour to see offbeat places in Amritsar which aren’t covered by most other tour operators. All their tours are detailed and include the tiniest tidbits which you would have otherwise missed. And they make sure that you are properly fed during these tours with the Amritsari delicacies for a completely blissful experience. 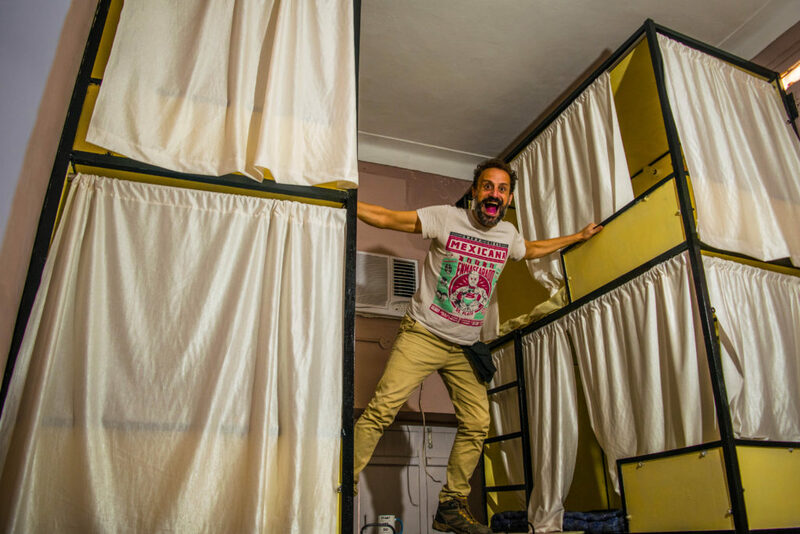 Now, you might be wondering what makes this hostel different from any other hostel in Amritsar. Well, here are a few reasons to convince you why you should City On Pedals for stay and tour option. One of the best things about City On Pedals is that they offer you both mixed dorms and female dorms at the same price of 400 INR. And in this price, you get free access to the kitchen, WiFi, water, and all the food items that are currently available in the kitchen. I am sure I don’t have to tell you this but getting stay with breakfast at such a low price is truly incredible. But, this is not even the best part of this hostel. The best thing is that you can book an entire mix-bed dorm for yourself and you can get your pets here too. Yes, that is right! This is one of the few hostels which actually allows you to bring your pets in. So, if you love traveling with your pet and have always faced problem while booking your stay, then City On Pedals is the perfect choice for you. Another great reason to choose this hostel is that it is near to all the important landmarks and services. The hostel is located at a distance of 1.5 km from the Amritsar Railway Station, 3.5 km from the Golden Temple, 2.5 km from Company Bagh, and just 10 km from the Amritsar Raja Sansi International Airport. So, in terms of accessibility, this is undoubtedly one of the best places to book your stay. If you are an animal lover (hint: dogs!) then you are absolutely going to love your stay here. There are two cute playmates, Tikka and Horsey, to keep you company here. Both of them are adorable and are sure to make you fall in love with them so you don’t have to worry about getting bored here. Apart from these two cuties, you also have other people to keep you company here. You will come across some or the other team member or volunteer staying at this hostel with whom you can bond and explore all the food centers available here. 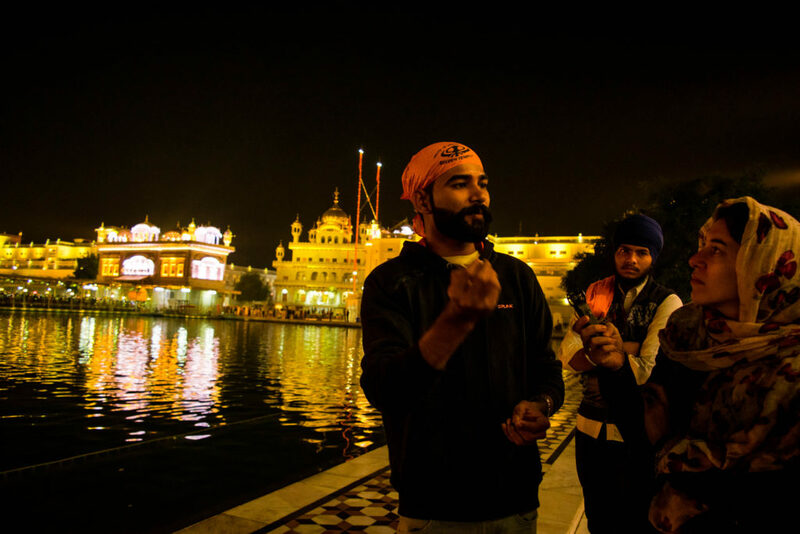 As I mentioned before, City On Pedals offers several culture and food tour options for you to choose from in order to learn more about Amritsar. So, if you are interested in going to Wagah Border or Golden Temple, then simply take a tour with them to understand the history behind the two places and to learn about places which most other people won’t even be aware of. As for the food tour, they keep on trying new places so that they can give the most authentic taste to their guests. So, if you take their food tour, you can be sure that you won’t be visiting any cliched places or overrated restaurants here. Another great thing about this hostel is that they have a separate co-working space for the digital nomads who visit their hostel. 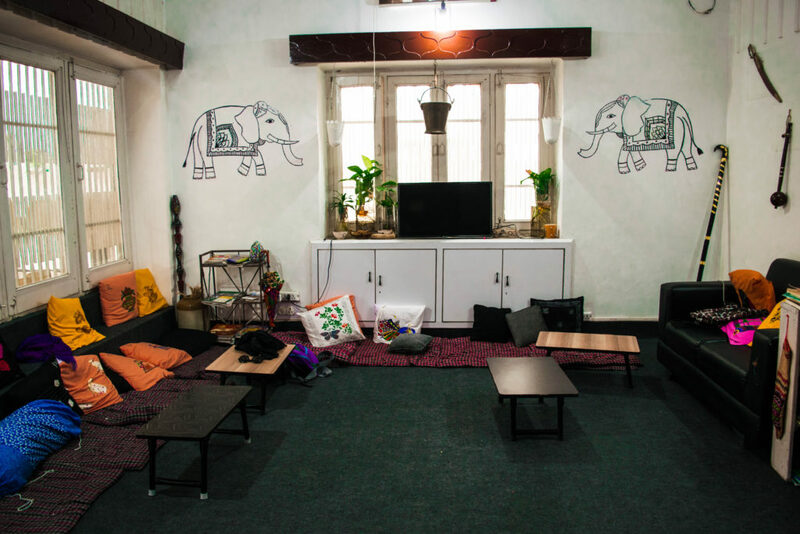 So, if you are on a work trip or a digital nomad who needs a quiet place and a good WiFi connection to work, then this hostel is ideal for you. You can also work in the Common area along with other people and can make several new friends this way. So, if you are a blogger (like me), vlogger, or anyone who needs the Internet to work then, you would definitely love this place. Finally, you have access to the common kitchen here where you can prepare your own food whenever you want. Usually, they keep the kitchen stocked with basic grocery items like bread, jam, cheese, coffee, milk, etc. So, you can use it to prepare a light breakfast for yourself. 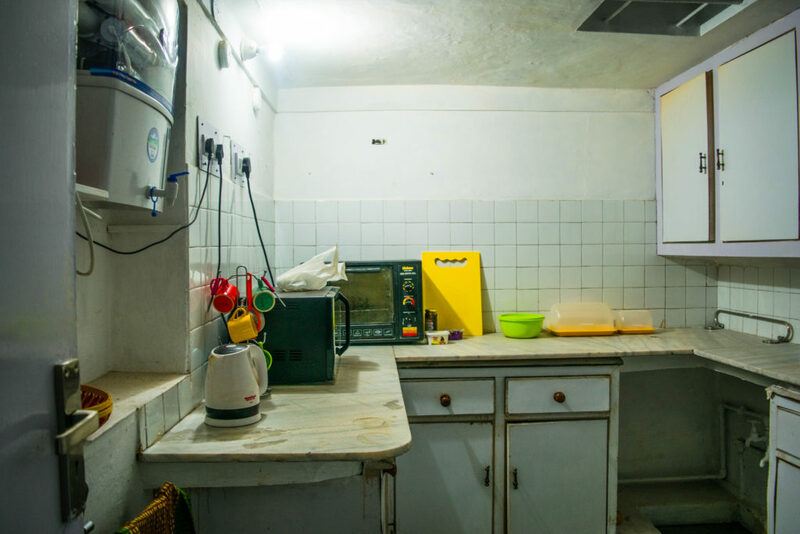 They also have a cook which usually prepares lunch and dinner which you are welcome to eat. But, if you want to cook your own meal then you can do that too here, you have access to all the utensils in the kitchen. One of the best tours for people who are curious about the Wagah border ceremony and wish to cover a few offbeat places on the way is the Amritsar Wagah Border Tour. In this tour, you get a chance to witness the Wagah Border Beating ceremony along with a visit to the Pul Kanjari, Mata Lal Devi Mandir, and an old Army bunker. Pul Kanjari is a 200-year old historic monument which has a fascinating story associated with it while Mata Lal Devi temple is one of the most intriguing Hindu temples in the world. All these places have interesting stories associated with them which you would learn more about on this Wagah Border tour. Another interesting tour to take up with City On Pedals is the Amritsar Village Tour which gives you a taste of local Punjabi village activities. In this tour, you will visit a local farm where you will learn more about the daily chores like milking the cow, plowing the fields, preparing food on a clay oven, and so on. This is a great way to get a glimpse of the lifestyle of Punjab’s countryside. A morning guided tour on cycle, this heritage tour includes all the major attractions along with a few offbeat places in Amritsar. You will explore the Town Hall, Company Bagh, Old Amritsar, etc. while enjoying some delicious Amritsari delicacies on the way. This is a great way to learn about the history and rich architecture here and you can see how the city looks like without crowded streets. It is a 3-3.5 hour tour which starts at 6- 7 a.m. in the morning. 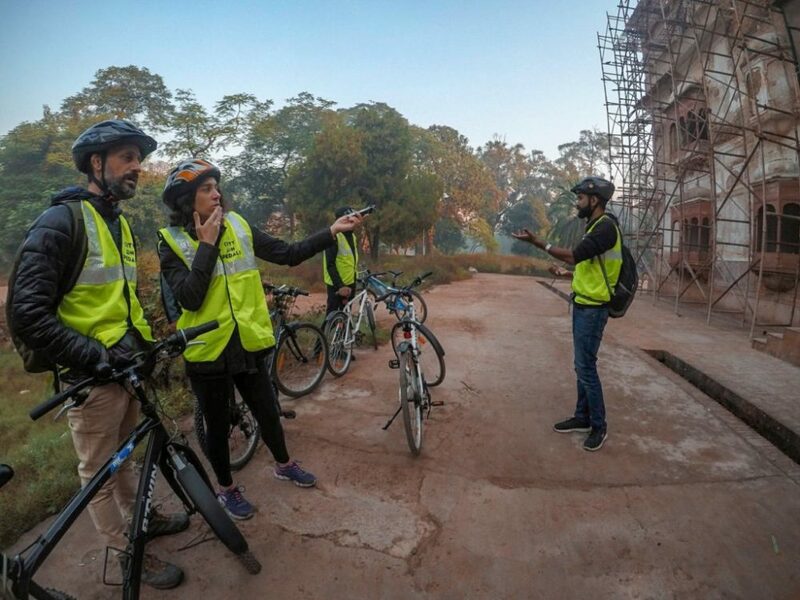 If cycling is something that you aren’t interested in then they also offer a walking tour to explore the various temples and monuments in Amritsar. On this tour, you will make way through the narrow bylanes and learn the invigorating history about each of the stops on your tour. This tour is a casual walk around the Golden Temple complex and gives you a complete dose of the local culture, history, and street food. One of the best ways to familiarize yourself with the Sikh history and customs related to the famous Golden Temple is to take an early morning walking tour of this place. Apart from learning about the history, you also get a chance to see the famous Palki Sahib Ceremony for which thousands of devoted Sikhs assemble every morning at the gate of the Golden Temple. You also get a chance to enter the kitchen of the Temple area and see how they prepare food for thousands of people every day. If interested, then you can also volunteer here to help them out and spend some time in the temple complex. Finally, you have the Food Bicycle tour in which you get a chance to taste Amritsar’s most famous street food options at local and authentic stalls. So, you don’t have to fight with crowds and you can be sure to avoid overrate food junctions on this simple yet delicious tour. On this food tour, you will taste the famous Amritsari Kulche, Aam Papad, Chaap, Gol Gappe, Banta Lemon, Jalebi, and so on. 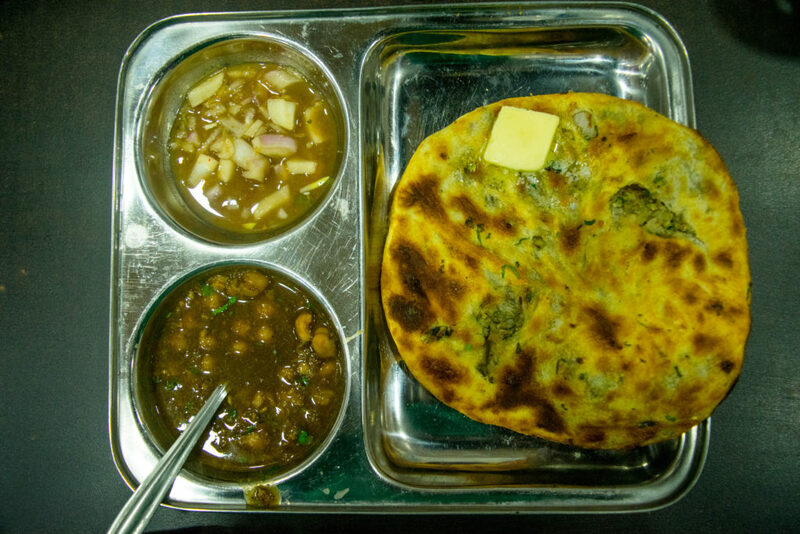 So, if you are a foodie like me then you absolutely have to take this tour to experience the best food in Amritsar. Honestly, I had the most wonderful time in Amritsar with City On Pedals. Rishabh made sure that I enjoyed myself and explored the city fully, including the offbeat places that most people don’t know about. He also made sure that I got a taste of the local Amritsari food including the Kulchas and was every-ready to help me out in case of an issue. I traveled alone to this city but I didn’t feel lonely here as I made so many friends in my hostel. I met an Argentinian couple, an African girl, and a Bolivian girl who were sweet and friendly and I enjoyed myself a lot with them. We talked, laughed, exchanged stories, and had the best time in Amritsar. And I have no one, other than City On Pedals to thank for this truly amazing experience. Have you stayed in City On Pedals too? Let us know about your experience with them in the comments below!